Whatever you think of Naxos – savior of classical music through its policy of underpaying artists to churn out CDs sold at bargain prices, or its undertaker? – you’ve got to be grateful to them for bringing out programs like this, that you would have rather expected to come from some small French label with Government-funding and very limited circulation. 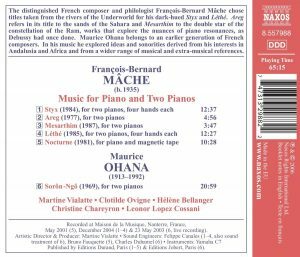 Quite an appropriate artistic decision too to have joined on disc these two composers, François-Bernard Mâche and Maurice Ohana. Not of the same generation, certainly: Ohana, who died in 1992, was born in 1913, which makes him roughly a contemporary of André Jolivet (1905-1974), Olivier Messiaen (1908-1992), Jean-Yves Daniel-Lesur (1908-2002), Pierre Schaeffer (1910-1995) and Henry Dutilleux (1916-2013), while Mâche, born in 1935, is of the same generation as… well, I can’t think of any MAJOR French composer of that generation (I can think of a number of minor ones, though, whose recognition is no more than local, and I can think of recognized French composers of LATER generations, like Aperghis, Dusapin, Florentz, Hersant… But those of Mâche’s generation, born in the 1930s, were probably all overshadowed by by the formidable impact of these two great figures born in the 1920s, Iannis Xenakis (1922-2001) and Pierre Boulez (1925-…), and condemned to be either epigones or outcasts. And that’s precisely the link between Ohana and Mâche: like, to a large extent, Xenakis, they are (were in the case of Ohana) two modernists certainly, but two independents also, who never subjected to the iron rule of serialism and post-serialism. They were and are part of no “school” – which means that no school is there to champion them either, and explains their relative, and totally unjustified, obscurity, not just internationally, but even in France. Ohana was feted and performed during his lifetime (the apex of his career and summation of his oeuvre was his opera La Celestine, given at the Paris Opera in 1988 in a production by Jorge Lavelli) but… as soon as he died, it was over, he all but disappeared from the radars (the same fate happened to André Jolivet). Mâche is still alive, and he gets his commissions, performances, honors and awards in France, but he’s not nearly as prominent and recognized (and represented on disc) as his compositional originality and value should warrant. Mâche was one of the co-founders, with Pierre Schaeffer, of the Groupe de Recherches Musicales (GRM) and one of the pioneers of mixing acoustic instruments and tape music. His piano pieces were composed between 1977 (Areg, track 2) and 1987 (Mesarthim, track 3) but, among them, only Nocturne (1981, track 5) uses tape, creating eerie resonating effects with the piano. Despite the title, the music is far from nocturnal and often very vehement (but after all nightmares too are nocturnal). The rest, wheter written for two pianos (Areg, Mesarthim) or two pianos played by four players (Styx from 1984, track 1, and Léthé from the following year, track 4), is immensely impressive, often using pounding repeated notes and chords in polyrhythms, or/and fast arpeggios over small ranges, especially in the bass registers, sometimes punctuated by pounding bass chords (Areg), creating huge halos of blasting sounds. Emerging from that thundering halo of sounds, some moments in Léthé (at 2:34 for instance) also sound like demented Boogie-Woogies reminiscent of Nancarrow’s music for player piano. The piano is so burdened with mighty 18th and 19th-century traditions that it is hard for a composer to liberate himself from them and invent new sounds from the old instrument. There’s a line going from Cowell to Crumb and Stephen Scott that did that by playing directly with the piano strings. Not so with Mâche, who is happy to have the keys struck in time-hallowed fashion, but still manages to create something original by making the listener forget the keys and articulation from note to note. One quibble I have with Naxos is that their ordering of the pieces seems totally arbitrary: it’s not chronological, it’s not alphabetical (! ), it seems totally random. This is especially regrettable in the case of Styx and Léthé, which are part of a cycle of four compositions using the names of the underground rivers of inferno in Greek mythology: the two others are Eridan for string quartet from 1986 (it has been recorded by the Arditti Quartet on Disques Montaigne) and Achéron for piano and percussion (2002; it’s a 5-minute piece and it might have been a good idea of Naxos to have recorded that one too). I have another recording of these two pieces, by the Dutch Pianists’ Quartet on Attacca Babel. In Styx, through a combination of more resonant sonics and more powerful interpretation, the Dutch players are more impressive than the French lady pianists of Naxos, but in Léthé I hear no clear-cut superiority of either. The rest of Naxos’ program is, to the best of my knowledge, without alternative. 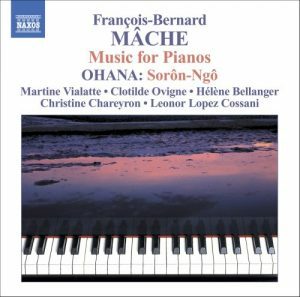 A check on the online resource center of Ircam shows that Mâche’s output for piano further includes Les Arcadiennes (Hommage to Couperin) for piano, 5 minutes (2007), Medusa for piano (2005), and Temes Nevimbur for two pianos, two percussions and tape, 16 minutes (1973). Ohana’s Sorôn-Ngô for two pianos proves that one could be a non-serial composer and still an avant-gardist. It is daunting and haunting music, one using the keys (and sometimes the directly the strings, occasionally strummed with sticks) not to produce melody, but pure sound, treating the piano as a percussive and coloristic instrument. The piece plays a lot on resonance (and the third pedal is precisely notated), low-sounding and slow-moving chords bathing in a haze of resonance (evoking some piano pieces of Henry Cowell, like Voice of Lir), alternating with hard-edged, pounding chords (one of Ohana’s instructions is “hard, crystalline”) whose profusion make them sound almost like natural phenomena rather than music, carillon effects, rapid succession of clusters evoking some alien aviary. Part of it is controlled improvisation, and precise synchronisation between the two pianos isn’t always required. You like it or not, you perceive and enjoy or not its very special sonic poetry, but it’s hard not to acknowledge the awesome degree of pianistic and sonic imagination and invention. There’s no real competition there. The two dedicatees and premiere performers, Geneviève Joy and Jacqueline Robin, recorded the piece shortly after its premiere in 1970, but only its first half, as it was still then a work in progress (it’s been collated in the great Erato-Ohana compilation, “Ohana: Les enregistrements Erato”). Since then Ohan completed it, and the final version is twice as long. It is that final version that Martine Vialatte and Leonor Lopez Cassani play here, and they do justice to this daunthing score, playing at times with even more precision than Joy and Robin (but it may be that Joy and Robin are playing an edition different from the one finally published). The recording however is a bit problematic: it’s live and there are various noises, coughs, pages turning, piano mechanism, where you’d want total concentration and focus on the sound, there’s not enough stereo separation I find between the two pianos so that it’s not always clear which one you are hearing especially in the bass notes, and the final chord, supposed to resonate to silence, is here abruptly and sloppily cut off, probably to get rid of the applause – but the could have faded it out, instead of this. But whatever these reservations, this is THE recording of Ohana’s Sorôn Ngô. TT 65.15. This is a disc for those who believe that contemporary music should explore new sonic paths, not just endlessly repeat the formulas of the past.